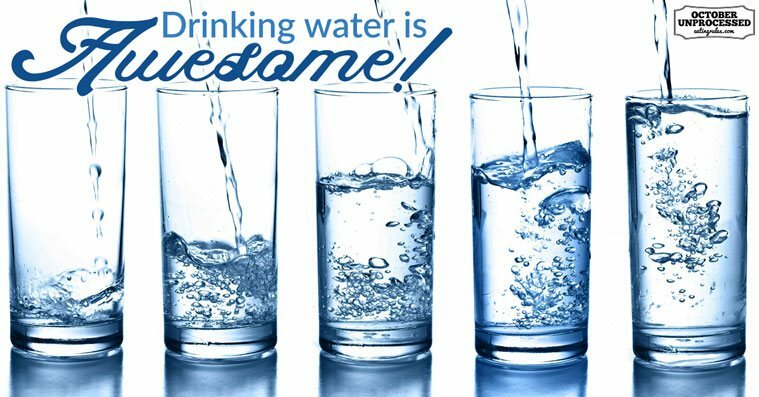 Home » October Unprocessed Posts » Food For Thought » Drinking water is AWESOME! This post is sponsored by Primo Water. Happy October Unprocessed! One of the most important things to keep in mind while taking a healthy eating challenge is to properly hydrate. While you’re already embarking on the awesome challenge of unprocessed eating, try taking note of how much water you’re drinking. Here’s why. Our bodies are composed of more than 70% water, so the water we drink can have a significant impact on our overall health. 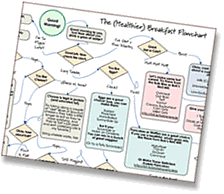 A healthy cell is one in which nutrients can easily get into the cell and toxins can efficiently get out. Healthy cells = healthy body. How does this work? By drinking water. What does drinking water do for our bodies? Aids in digestion: Digestion starts with saliva, the basis of which is water. Digestion relies on enzymes that are found in saliva to help break down food and liquid and to dissolve minerals and other nutrients. Proper digestion makes minerals and nutrients more accessible to the body. 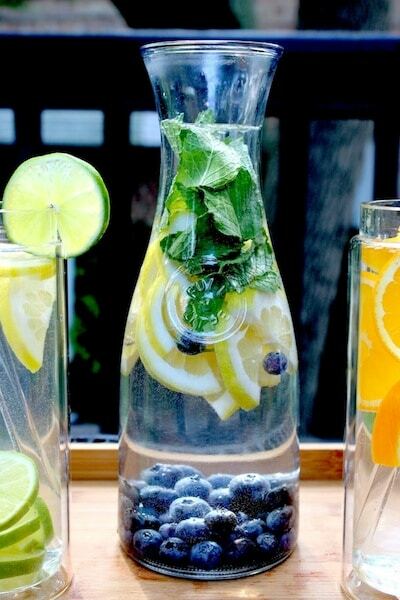 Water is also necessary to help you digest soluble fiber. With the help of water, this fiber dissolves easily and benefits your bowel health by making well-formed, soft stools that are easy to pass. Flushes our bodies of wastes: Our kidneys are fantastic removers; they get rid of the waste products from protein metabolism—uric acid, urea, and lactic acid—but they need lots of water to accomplish this. The kidneys are responsible for removing excess hormones, vitamins, minerals, and foreign toxins such as drugs, chemicals, and food additives. Keeps our moisture-rich organs (our skin, eyes, mouth, and nose) functioning well. Lubricates and cushions our joints: Our joints depend on our water and nutrient intake to keep them lubricated and supple. Think of it like oil to a hinge. And if that’s not reason enough to keep drinking water, keep in mind that drinking enough water can also keep your body’s hunger signals in-check. It happens that some of the time we can mistake hunger for thirst, so be sure to drink plenty of water before reaching for an extra snack! Have a craving for flavor? 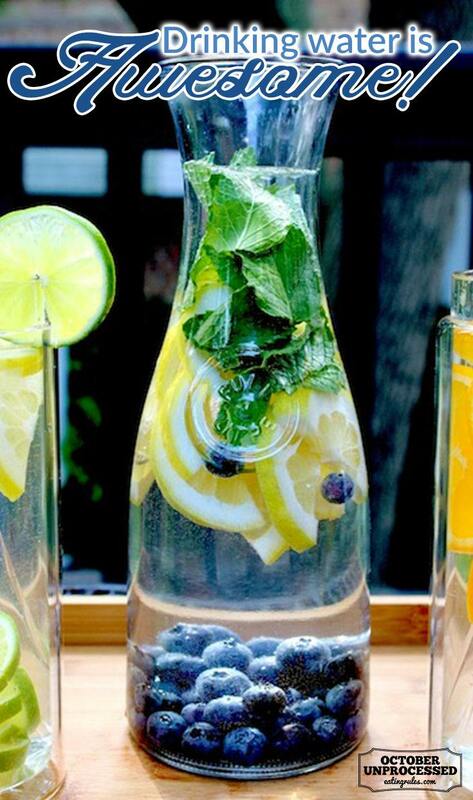 Make a quenching combination. There’s still time to enter the Primo Water Giveaway! 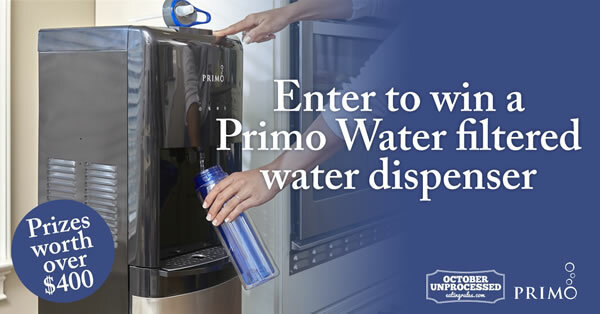 Have you signed up for a chance to win a Primo Water dispenser and 2 5-gallon jugs of water yet? There’s no purchase necessary to enter – but hurry, the giveaway ends October 10th! Annie Asebrook is the Digital Creative Director at Primo Water, which offers consumers both innovative, stylish water dispensers for the home and office and clean, great tasting purified water using Refill and Exchange processes that are affordable, convenient options to give your family great tasting, premium water without creating waste in the environment. Annie is an artist and parent who fuses together her passion for her family and her wonderful sense of how to communicate – both visually and with words to inspire families to live healthier lives. You can also find Primo Water on Facebook, Twitter, and Pinterest.